Telepresence services, and especially managed telepresence services, are weathering the current economic storm, according to multiple providers and vendors, but the sales tactics for these services are changing somewhat. "To be honest, we are seeing telepresence take off like crazy," said Jeff Prestel, general manager of the video solutions division at BT, which this week announced it was adding Polycom telepresence gear to its managed services offering. "You would think with the current economic challenges, given it's a high-ticket item, that would be the first thing people would stop spending on, but we are seeing even more interest - our fastest area of growth is in telepresence. It is growing rapidly." Other telepresence service providers aren't quite as gung-ho but are still upbeat about their offerings. "It's hard to say how the economic downturn is affecting telepresence because everything is still so new and nascent," said Alan Benway, executive director of AT&T Telepresence solutions, which announced its Cisco-based service last April. "There is still lots and lots of interest and discussion with customers. Some are moving faster than others. Some are, depending on their business, slowing down a bit." At Telanetix, where telepresence is about 20% of the overall managed services business, interest remains strong, but the sales cycle is a little longer, said Doug Johnson, chief executive officer. One reason for that is the Telanetix approach requires customers to invest in the video endpoints that sit on their premises. "Because the solution requires a capital outlay, what we have seen is actually sales cycles delay slightly, although the interest is keen," Johnson said. "We have seen people evaluate all of their capital decision-making. We anticipate companies are more interested than ever in the technology for the simple ability to reduce costs and time." It was once possible to sell telepresence primarily as a means to reduce executive travel costs, but while that is still a compelling argument for some companies, it doesn't work as simply as it used to, Benway said. "Some companies now say they've eliminated their travel budget altogether, because of the economy," the AT&T executive said. "We believe that travel reduction is just the tip of the iceberg. Telepresence, with the ability to collaborate in a face-to-face way on short notice, can help a company do business in new and better ways. If you are thinking about that - 'Can I bring my products to market more quickly, and what is that worth to me?' - it's a different way to prove the value of telepresence. Even if travel were free, there's still that efficiency. How long does it take somebody to travel to China or Europe or cross-country? These are often highly paid knowledge workers and executives. What is the cost to quality of life?" 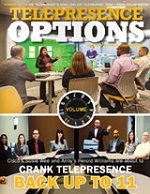 When Cisco launched its telepresence technology in 2006, the vendor deployed the equipment internally and paid for it with travel savings, said Erica Schroeder, director of marketing for telepresence at Cisco. "We deployed it for other reasons, but we paid for it out of the travel budget," Schroeder said. "When we first started selling, companies were first interested in being more competitive - they wanted to scale their experts globally and be more productive. Then we heard about a greener strategy. But the general bumper sticker for telepresence was that it was all about cutting travel dollars. In an environment like today's economy, collaboration and productivity are much more top-of-mind for people." As the market matures - though it's still very young - equipment prices are coming down. Tandberg recently announced lower price points for its telepresence gear and Polycom announced lower prices on high-resolution videoconferencing equipment as both try to extend the reach of higher quality videoconferencing to the small and mid-sized business market. Even with cheaper equipment, companies are trending toward managed services in this economy, Schroeder said. "People are increasingly interested in a managed service offering," she said. "That way, a carrier like AT&T or BT owns the equipment, and the customer pays a monthly service fee." 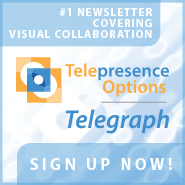 Another option is public telepresence sites. Tata, which owns the Taj Hotel and Tata Communications, is building out public telepresence sites globally that companies can use on a pay-as-you-go basis, Schroeder said. "They are planning more than 100 locations," she said. BT is looking to make telepresence an even more useful collaboration tool by making it easier for companies to communicate with other companies, who may not use the exact same video technology, Prestel said. That's one of the goals of the new agreement with Polycom. "Polycom has a large installed base of traditional videoconferencing," Prestel said. "Polycom's telepresence gear can interoperate with the traditional equipment, and if that equipment is high-definition, you can do the conferencing in high definition. That gives a company that already has some equipment that they don't just want to write off the ability to do enterprise-wide telepresence that is high-definition, whether it is in a large immersive room or a videoconferencing room. We can do intercompany communications with Polycom, which gets to the real advantage of collaboration. As long as a company has videoconferencing equipment and we have access to that through an IP number, we can bridge those together to do intercompany videoconferencing, and that is part of what we bring as a service provider." \"To be honest, we are seeing telepresence take off like crazy,\" said Jeff Prestel, general manager of the video solutions division at BT, which this week announced it was adding Polycom telepresence gear to its managed services offering. \"You would think with the current economic challenges, given it's a high-ticket item, that would be the first thing people would stop spending on, but we are seeing even more interest - our fastest area of growth is in telepresence. It is growing rapidly.\"
\"It's hard to say how the economic downturn is affecting telepresence because everything is still so new and nascent,\" said Alan Benway, executive director of AT&T Telepresence solutions, which announced its Cisco-based service last April. \"There is still lots and lots of interest and discussion with customers. Some are moving faster than others. Some are, depending on their business, slowing down a bit.\"
\"Because the solution requires a capital outlay, what we have seen is actually sales cycles delay slightly, although the interest is keen,\" Johnson said. \"We have seen people evaluate all of their capital decision-making. We anticipate companies are more interested than ever in the technology for the simple ability to reduce costs and time.\"
\"Some companies now say they've eliminated their travel budget altogether, because of the economy,\" the AT&T executive said. \"We believe that travel reduction is just the tip of the iceberg. Telepresence, with the ability to collaborate in a face-to-face way on short notice, can help a company do business in new and better ways. If you are thinking about that - 'Can I bring my products to market more quickly, and what is that worth to me?' - it's a different way to prove the value of telepresence. Even if travel were free, there's still that efficiency. How long does it take somebody to travel to China or Europe or cross-country? These are often highly paid knowledge workers and executives. What is the cost to quality of life?\"
When Cisco launched its telepresence technology in 2006, the vendor deployed the equipment internally and paid for it with travel savings, said Erica Schroeder, director of marketing for telepresence at Cisco. \"We deployed it for other reasons, but we paid for it out of the travel budget,\" Schroeder said. \"When we first started selling, companies were first interested in being more competitive - they wanted to scale their experts globally and be more productive. Then we heard about a greener strategy. But the general bumper sticker for telepresence was that it was all about cutting travel dollars. In an environment like today's economy, collaboration and productivity are much more top-of-mind for people.\"
Even with cheaper equipment, companies are trending toward managed services in this economy, Schroeder said. \"People are increasingly interested in a managed service offering,\" she said. \"That way, a carrier like AT&T or BT owns the equipment, and the customer pays a monthly service fee.\"
Another option is public telepresence sites. Tata, which owns the Taj Hotel and Tata Communications, is building out public telepresence sites globally that companies can use on a pay-as-you-go basis, Schroeder said. \"They are planning more than 100 locations,\" she said. \"Polycom has a large installed base of traditional videoconferencing,\" Prestel said. \"Polycom's telepresence gear can interoperate with the traditional equipment, and if that equipment is high-definition, you can do the conferencing in high definition. That gives a company that already has some equipment that they don't just want to write off the ability to do enterprise-wide telepresence that is high-definition, whether it is in a large immersive room or a videoconferencing room. We can do intercompany communications with Polycom, which gets to the real advantage of collaboration. As long as a company has videoconferencing equipment and we have access to that through an IP number, we can bridge those together to do intercompany videoconferencing, and that is part of what we bring as a service provider.\"